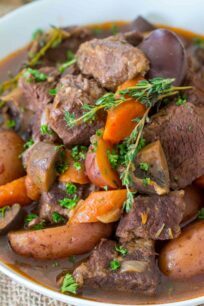 Instant Pot Beef Bourguignon is one delicious meal, made in a fraction of the time. Tender, melt in your mouth pieces of beef, cooked with veggies in a wine broth. Add beef chunks to a large bowl, sprinkle flour, salt and pepper onto it. Stir to combine. Once the oil is hot, cook the beef in batches 2-3 minutes on each side until nice and brown. Remove the beef from the pot, cover with foil and set aside. Add the chopped onion to the pot and cook for 1 minute, add the garlic, stir and cook for 1 minute. Add the cup of beef broth, and using a wooden spoon scrape well the bottom of the Instant Pot to remove any bits that stuck to it, make sure you scrape it well to avoid burning during cooking. Add the beef back to the pot, add tomato paste, tomato sauce and Worcestershire sauce. Add chopped carrots, mushrooms and celery if using. Add wine and potatoes. Make sure you don't go over the Max line of your pot. Add dried rosemary, thyme and red pepper flakes. Stir to combine. Add a bunch of fresh thyme on top. Close the lid and seal the valve. Cook for 35 minutes on High Pressure. Once the Instant Pot beeps, do a 10 Minute Natural Pressure Release. Release manually the remaining pressure. If you want the beef bourguignon sauce to be thicker, mix corn starch and water in a small bowl until fully combined. With the IP on Saute, add the mixture to the pot and gently stir, trying not to crush the veggies. Cook for a few minutes until the sauce thickens. Use Yukon potatoes if you are looking for the potatoes to hold their shape better.